The Deck is the more mellow part of Moonshine Flats, which is 10, 000 sq feet of live music, line dancing and DJ’s spinning country, pop and rock music. The Deck is an open air venue in the back of Moonshine .It features corn hole, shuffleboard and ping pong. Oh, and a pretty good smokehouse menu served by Chef Todd Nash. I was lucky to be there on opening night of them serving their new BBQ menu and was pleasantly surprised to find Chef Todd seems to know what he’s doing with the meats there. This man has been practicing his low and slow cooking methods and if the first night was any indication, there are even better things to come there. I did my usual and ordered a little bit of everything, so I can tell my foodie fans just what’s up at this new BBQ mecca. I ordered their combo plate which you can see on top here. Tasty, tender spare ribs. Nice smoke ring. Smoked BBQ? YES PLEASE!! I really liked their chicken wings. 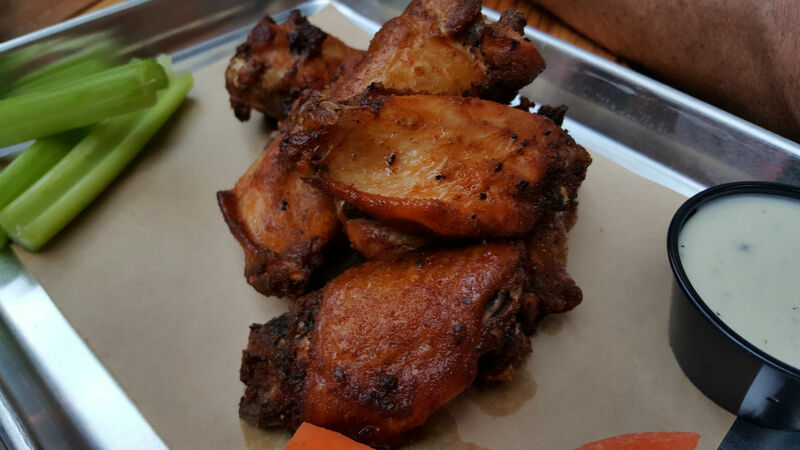 While I did like the smokiness in their wings, their other meats are what really stood out for me. It should be stated that this was their first night serving food. Good job Chef Todd and crew! I ordered their combo plate which had 4 meats and two sides for $23. Nice and filling. I’m a rib girl and I really loved the depth of flavor of their ribs. The flavor was smokey, sweet, had layers of tastiness, they were quite tender and came off the bone easily without totally falling off which I don’t care for if they are mushy. That means they’re overcooked in competition rules. I thought the pulled pork was a bit dry and when I told the server that, she told the chef and he sent out a bit more which was definitely more juicy. The brisket also had great flavor, but was a bit overcooked. Again, better than under cooked. Tri tip was a bit tough for me and not a cut of meat that is a favorite of mine. I was with my friend Lyndsi and her bf Tony and he loved their tri tip. 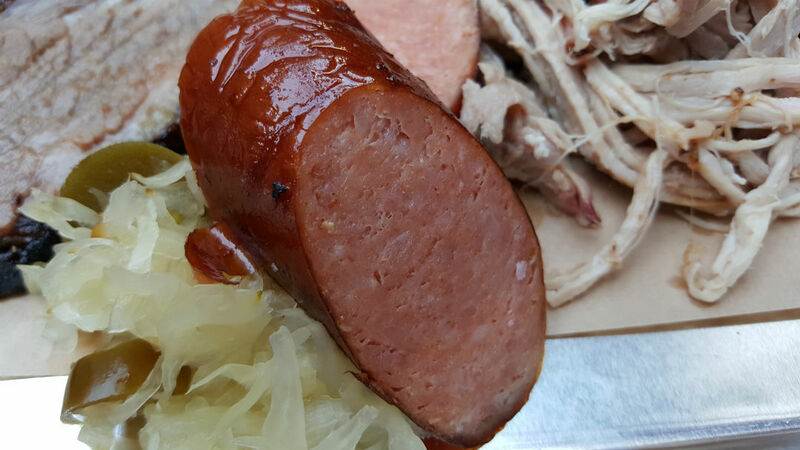 Kielbasa/Sausage was the bomb, nice and tasty with just the right amount of spice and smoke. Thankfully, they didn’t smother the meats with any sauce, but served it on the side. I liked their sauce, if a bit sweet for me. I like a bit more molasses flavor. 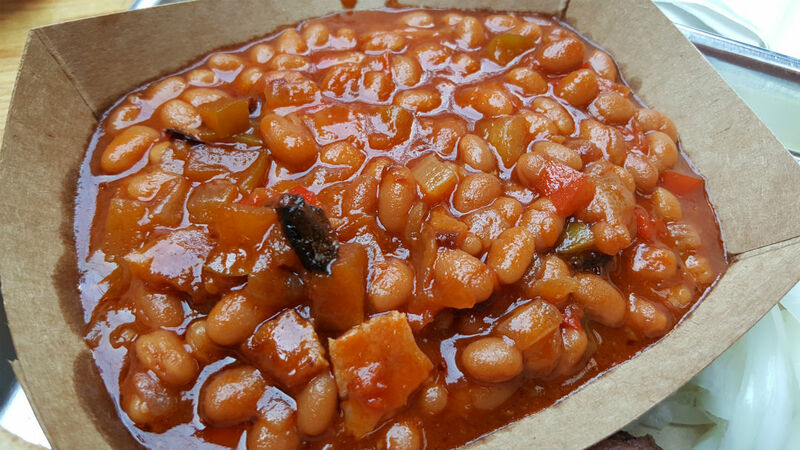 For sides I had their BBQ beans, they were really good and had bacon in it! 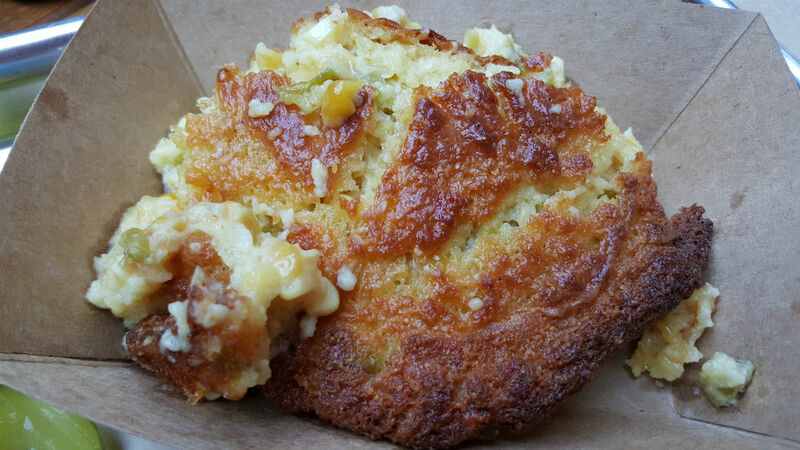 Their corn pudding blew me away. I’ve had it before, but this was one of the best I’ve had. Flavorful, crusty and great texture. Chef came out and wanted to know what I thought and I was honest about it all. I also met assistant GM Jack and when I told him what I thought and how I loved the ribs, he insisted I take home a rack of them on the house! I also got to order their cole slaw and their potato salad. Loved the flavor of both, but I like my pieces of potato a bit smaller. Minor complaint. I think if they work with everything a bit more, they are going to shine with their Q. BBQ is so big right now. 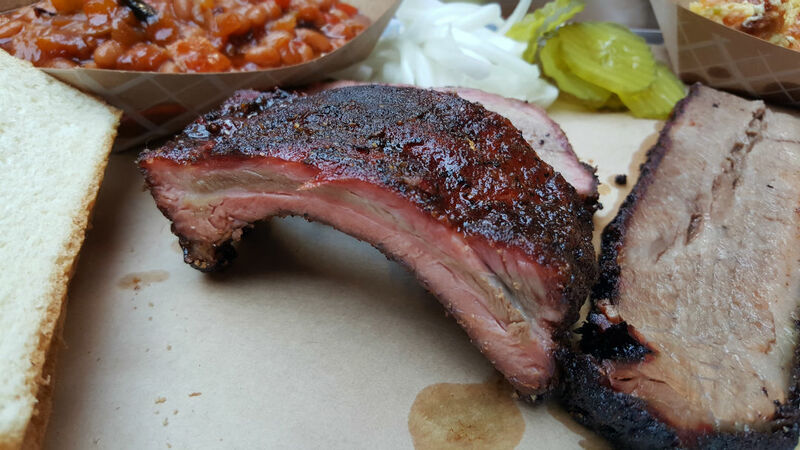 6 new BBQ places just opened in SD and I can’t wait to try them all. Moonshine Flats is putting in their take on BBQ and if they promote it right, it’s going to be BIG!